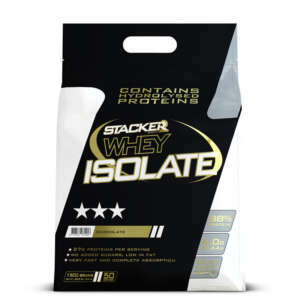 Whey Isolate is the most advanced protein in the Stacker2 Europe product range. It has a protein percentage of 88% and comes with the best mouth-watering flavours on the market. The complete solubility make Whey Isolate the best choice for gym goers and top athletes who want the very best. So why is WPC sometimes insufficient for athletes? WPC is relatively rich in carbohydrates, fat and lactose. Even if we’re only dealing with a few percentage points, a serious athlete will never be satisfied with something good when something better is available. And Whey Isolate is better, there’s no doubt about that! The most important advantage of Whey Isolate is that the proteins absorb super-fast, faster than a WPC shake. What’s more, Whey Isolate has fewer carbohydrates, less fat and less lactose. That’s why athletes choose Whey Isolate, because only a whey isolate fulfils the demanding requirements of a top athlete. One portion of Whey Isolate 30 grams powder will yield 11 grams of glutamine and BCAAs. These are the most important amino acids for muscle building and muscle recovery. Whey Isolate absorbs so fast, your tired muscles will recover within no time! Whey Isolate thus speeds up your recovery phase, thereby increasing your resting phase (the muscle’s growth phase!). The longer your muscles rest, the stronger they will become and the better performance you will deliver during your next training session or competition. In total, one portion of Whey Isolate provides 12 grams of essential amino acids, 5 grams of glutamine and 26 total grams of proteins. An independent taste panel comprised of various renowned athletes was unanimous in its opinion that our Whey Isolate is among the best protein shakes available on the market. Whey Isolate is therefore among the best supplements in our product range not only due to the quality and high protein content, but also in regard to taste, creaminess and dissolution behaviour. A delicious shake without lumps and without foam formation. Whey Isolate stands for an absolute top product. Add one scoop to 200ml of cold water. Mix for 10 seconds and your shake is ready/ For maximum results, 2-3 servings daily. Whey is a 100% natural ingredient. It comes from cows, and the milk production process and ultimately the cheese production process create (liquid) whey proteins. In order to turn this rich-protein liquid into a supplement for athletes, it is necessary to separate the pure, high-quality proteins from the liquid. The most often used method is microfiltration, whereby the liquid disappear and a WPC (whey protein concentrate) powder remains. WPC is a basic supplement for almost every strength athlete and endurance athlete. Our Whey Isolate is now available in 5 delicious flavours (chocolate, vanilla, strawberry, pineapple-coconut, banana) and fulfils the European Union’s quality requirements. This product is suitable for top athletes (guaranteed doping-free). Find out for yourself. Is Whey Isolate best used during the day, or the evening? Whey Isolate is best used during the day, or immediately after training. In the evening, grab a protein which is slowly digested, such as our product 100% Casein. Is there a lot of lactose in Whey Isolate? We want to mention that there is a very small fraction of lactose present in the raw material WPI. 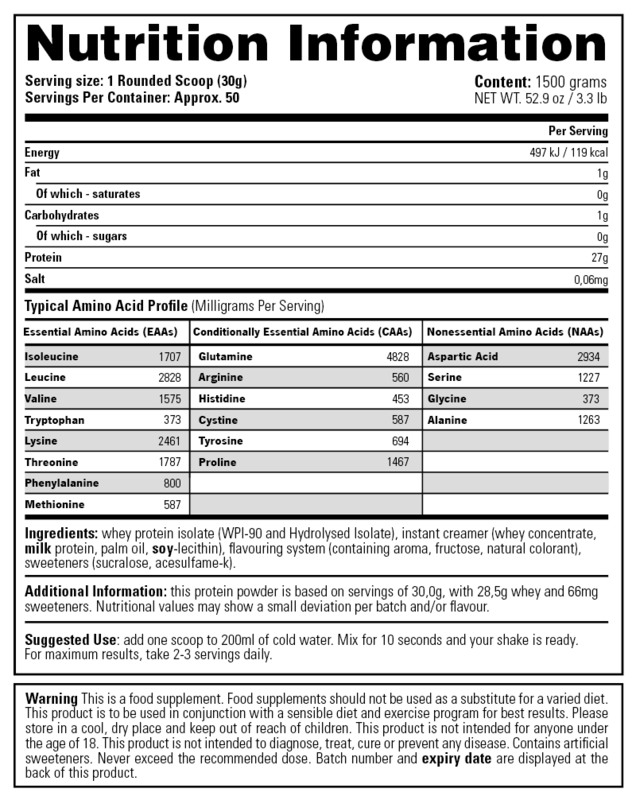 Feedback from people with lactose intolerance shows that they have absolutely no problems with this Whey Isolate, because the amount is virtually zero. I follow a vegetarian diet. Can I use this product? I drink it with my BCAA after my training session. Really good, and easy to digest. Marvellous composition. I think this is one of the best shakes available. Tastes delicious, and you never get any lumps forming. I drink it after a training session. It’s really to be recommended. A super protein isolate. Zero sugars, so ideal for my schedule.